To inspire healthy and sustainable living around the world, by empowering people with the technology and training to do so. As we leave this cold, bitter winter and move into spring, our outdoor Tower Garden® farmers begin preparing for the spring rush that is just around the corner. Did you know that erratic weather patterns tend to create severe pest problems during the growing season when the natural balance of life is disturbed? With this in mind, I encourage you to be well prepared in advance this spring. Below are three of my favorite organic sprays that have given our growers tremendous success — even in a place like Florida — during the warmer summer months! If you are a home gardener, you can use the same formulas to easily and safely control pests right in your own back yard! Mix everything well, and then continue to shake periodically during use. Always spray in morning, before sunrise, or in late evening. Never spray in sunlight. Spray plants liberally — soak them — and be sure to wet the undersides of leaves where the insects feed. Discard old spray. Do not save! Clean sprayer well after each use. Follow instructions on label, and mix well. 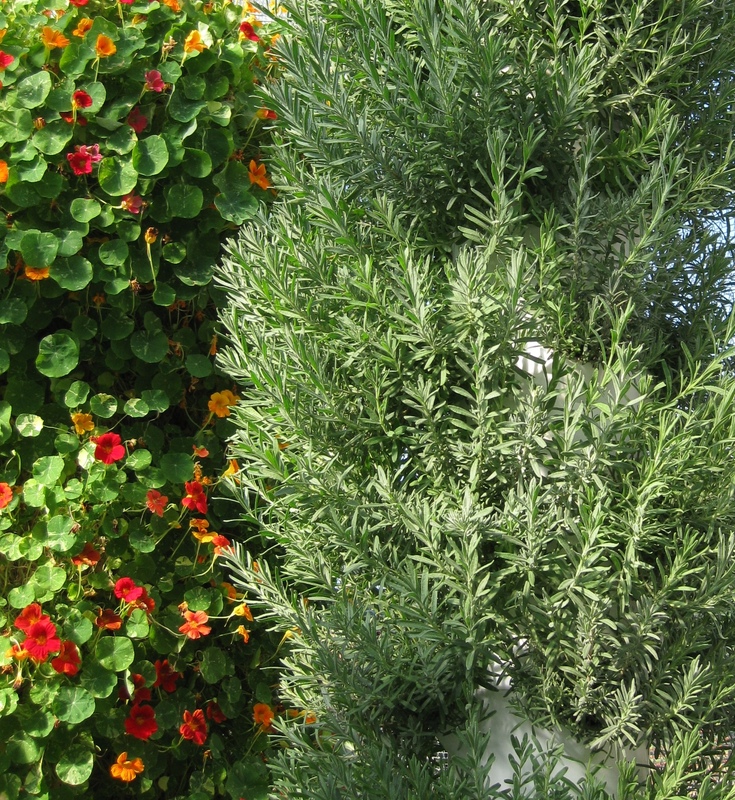 Spray plants liberally — soak them — and be sure to wet the undersides of leaves where worms or caterpillars feed. Apply this formula when you first start seeing worms in the areas they are feeding. Spray plants liberally. Soak the plants well. Apply this formula once a week during light fungus season, or twice a week during heavy fungus season. Whether you are a commercial farmer or a home gardener, these safe organic sprays are tried and true. 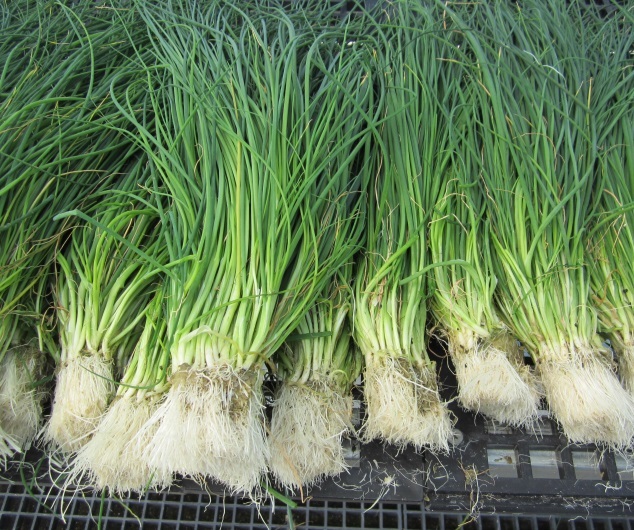 Future Growing’s commercial farmers can find these and many other fine products at the Future Growing® Growers Store. For home gardeners, please visit the Tower Garden® Store and choose “Natural Pest Control” from the Products menu at the left side. This entry was posted in Posts and tagged aeroponic, aeroponics, Beneficial insects, Beyond Organic, chemical-free food, farm to table, farm to table movement, Future Growing, Future Growing LLC, green rooftops, horticulture, Integrated Pest Management, IPM, Jessica Blank, live produce, Living Produce, local food, Local Food Movement, locally sourced, locavore, locavore movement, modern agriculture, natural foods, natural pest control, Non-GMO, Non-GMO Foods, non-GMO products, Pest control, pesticide-free food, reduce the carbon footprint, Rooftop Farm, Rooftop Farmer, rooftop farming, sustainability, sustainable, Sustainable agriculture, sustainable food, sustainable food movement, The Vertical Farmer, tim blank, Tower Garden, Urban Farm, Urban Farmer, urban farming, vertical farm, Vertical Farmer, Vertical Farming, vertical growing, water conservation in agriculture on March 5, 2014 by futuregrowing. Since 2006, Future Growing® has been partnering with the nation’s leading schools to create healthier lunches and hands-on science lessons. It’s gratifying to see Future Growing’s® aeroponic technology being welcomed by education, because we know firsthand how students of all ages benefit from learning to grow food in their schools. These kids will soon be the decision-makers of the 21st century, and will be faced with serious choices on managing our future supplies and quality of water, air, and soil. On my recent trip to the Hawaiian Islands, I had a chance to share in and to implement the future of sustainable vertical aeroponic food production. Wherever I travel in the U.S. today, it is an area where our fresh water supply is limited or almost gone, the water is contaminated, and land is expensive. Everyone is simply running out of space for agriculture, and Hawaii is no exception. For over 1,000 years the Hawaiian people produced enough food to support an estimated population of 1 million. Today, 85 to 90 percent of Hawaii’s food is imported. 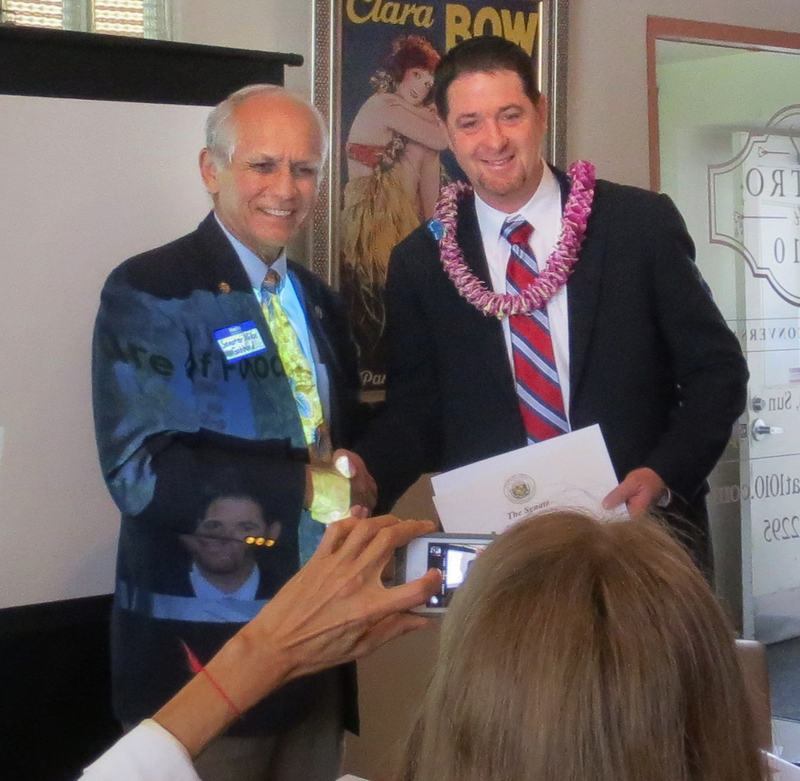 Pictured here is Hawaii state senator Mike Gabbard presenting an award to Future Growing founder and CEO Tim Blank in Honululu on Feb. 10, 2014. I was truly humbled by the thoughtful kindness provided to me by the Hawaiian people. 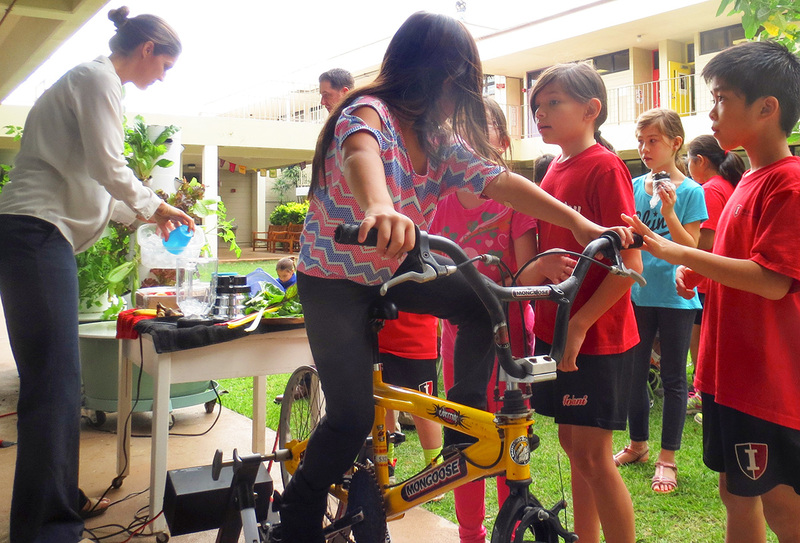 During Tim Blank’s visit to ’Iolani School in Honolulu, students pedal a stationary bike that operates a blender used to make fresh fruit and vegetable smoothies. Even more exciting was my trip to Hawaii’s Sullivan Center for Innovation and Leadership on the campus of Iolani School in Honolulu. Here I got to spend time with our nation’s youngest future leaders. During my tour of the school, it seemed that Tower Gardens® popped up around every corner and the school had engaged in radical growing behavior! I was invited to share in a traditional Hawaiian Tower Garden® lunch, but it was anything but traditional. Kids were harvesting their own salads and vegetables. Another group was pedaling a stationary bike that powered a blender making green smoothies! Wow! These kids are living beyond any green standards I have ever seen. It got even better than that. During lunch, our mascot “Phytonutrient” (pictured at right, with Tim) was teaching all the children the importance of the colors in food, or phytonutrients, which only come from fresh fruits and vegetables. Phytonutrients heal and protect our bodies from disease, they explained. At this school, science truly demonstrates that children who grow their own fruits and vegetables certantly eat more fruits and vegetables! The Tower Garden® program has been so successful at the Sullivan Center for Innovation and Leadership that we are now working to convert the school’s existing green roof into a massive Future Growing® aeroponic Tower Garden® farm. This will eliminate the need for ANY fresh fruits and vegetables to be shipped to the school! Once installed, this farm will supply all-natural, sustainable produce, using 90 percent less water and 90 percent less land, and no chemicals. The produce will also be hyper-local: it will literally be walked from the roof to the school’s cafeteria, almost completely eliminating the carbon footprint of the school’s food supply chain. Imagine a school that graduates locavores, carbon footprint experts, and professional hydroponic farmers. Keep up the great work and innovation, Hawaii! This entry was posted in Posts and tagged aeroponic farms, aeroponics, Beneficial insects, chemical-free food, farm to school, farm to table, farm to table movement, Future Growing, Future Growing LLC, green rooftops, Hawaii, Honolulu, Integrated Pest Management, Iolani School, IPM, Jessica Blank, live produce, Living Produce, local food, Local Food Movement, locavore, locavore movement, modern agriculture, natural foods, Non-GMO, Non-GMO Foods, non-GMO products, Pest control, pesticide-free food, Phytonutrients, reduce the carbon footprint, Rooftop Farm, Rooftop Farmer, rooftop farming, Senator Mike Gabbard, Sullivan Center for Innovation and Leadership, sustainability, sustainable, Sustainable agriculture, sustainable food, sustainable food movement, The Vertical Farmer, tim blank, Tower Garden, Urban Farm, Urban Farmer, urban farming, vertical farm, Vertical Farmer, Vertical Farming, vertical growing, water conservation in agriculture on February 19, 2014 by futuregrowing. Our mission at Future Growing® is to inspire healthy and sustainable living around the world, by empowering people with the technology and training to do so. We have been on this journey for almost a decade, with over 100 successful projects across North America. The local, grass roots urban food movement has given us the opportunity to meet some truly extraordinary people along the way, and the urban farmer we’ve featured this week is no exception. She is not only a first-class producer of premium produce, but has been instrumental in transforming the quality and standards for the locally grown food market in Central Florida. I met Katherine Grandey, co-founder and owner of “The GreenHouse”, in Orlando, Fla., three years ago. Even though she was a highly-educated professional with a career and a young family, she wanted to be more engaged with her family, live a healthier life, and run her own company. Produce healthy, safe food for her family. Provide local, healthy, chemical-free, low-carbon footprint food to the Orlando-area community. Work a moderate amount of hours and have time to raise her children. Produce food that is “beyond organic”, meaning that the food is more nutritious, has a smaller carbon footprint, and uses far less water. Start off with a 100-tower Tower Garden® farm in an affordable 48′ x 48′ greenhouse and office. Utilize Future Growing® patented vertical aeroponic technology to grow a multitude of produce in very little space to produce the highest quality local food available in Central Florida. Katherine, I am so proud of the work you are doing! You are obviously very busy. Who are your current clients? Several high-end restaurants at the Walt Disney World resorts, along with Emeril’s Orlando, Ritz Carlton, Marriott World Center, Hilton, and several others. These are big accounts! How did you land them…and keep them buying from you year round? It is a well known fact that food grown in Florida has heavy pesticide residues. This is a natural side effect of farming in a state that has tremendous insect and disease pressures. The emerging local food movement in “the Sunshine State”, combined with the state’s looming water crisis, has created a boom of opportunity for farmers like me. The restaurants we sell to demand the highest quality local, healthy, pesticide-free food. They also need seasonal consistency, which is something that has not been possible for outdoor farms. The Future Growing® Tower Gardens® allow us to have total control over the growth of the plant. The towers are so predictable and grow plants so consistently, that we can plan our seeding, transplanting and harvest four to six weeks in advance and be able to count on those numbers. We also have incredibly small losses, and the consistency of growing allows us to be able to deliver the same quantities weekly to our restaurants, making us a lot more reliable than “traditional” farms. Because Orlando hosts large, international conventions, we can even accommodate special events and one-time orders, if we know far enough in advance. What crops does The GreenHouse specialize in? 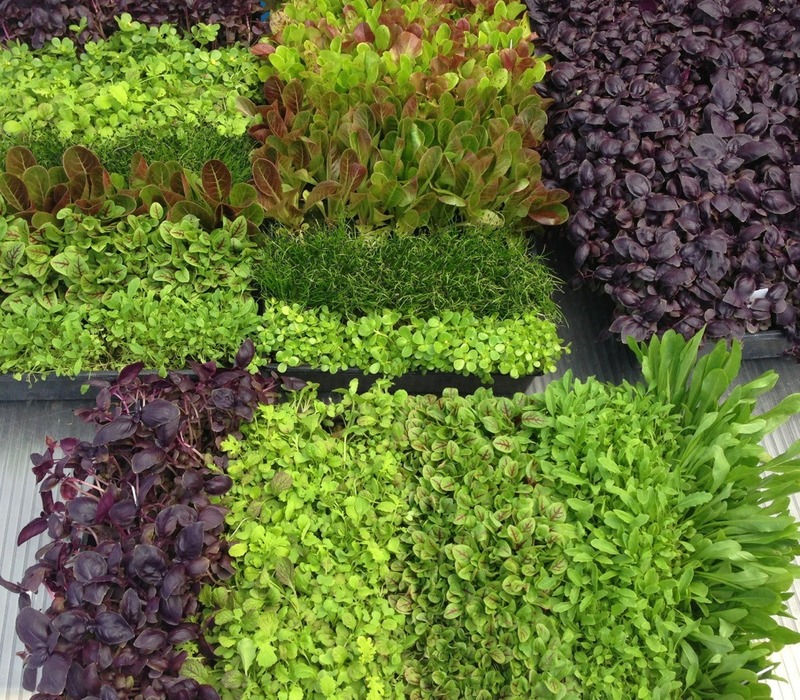 Petite leafy greens, lettuces, herbs and micro greens. 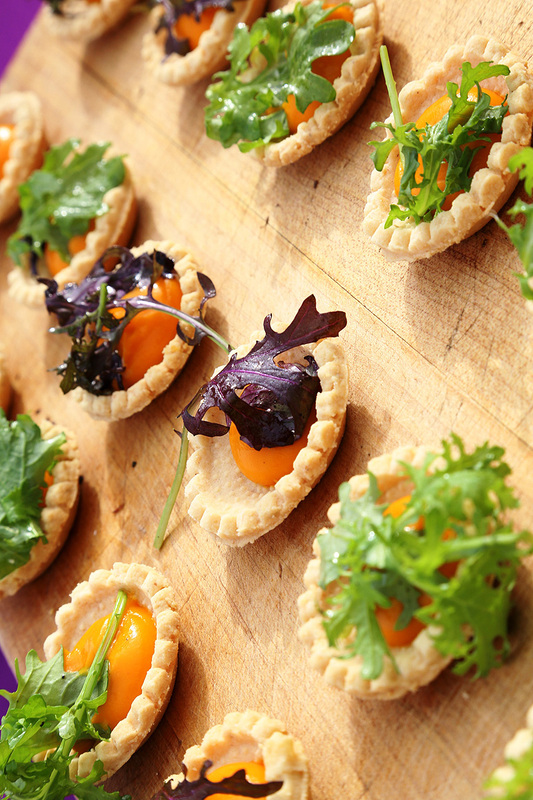 A few of our micro greens include arugula, green sorrel, Swiss chard, and Tuscan kale. 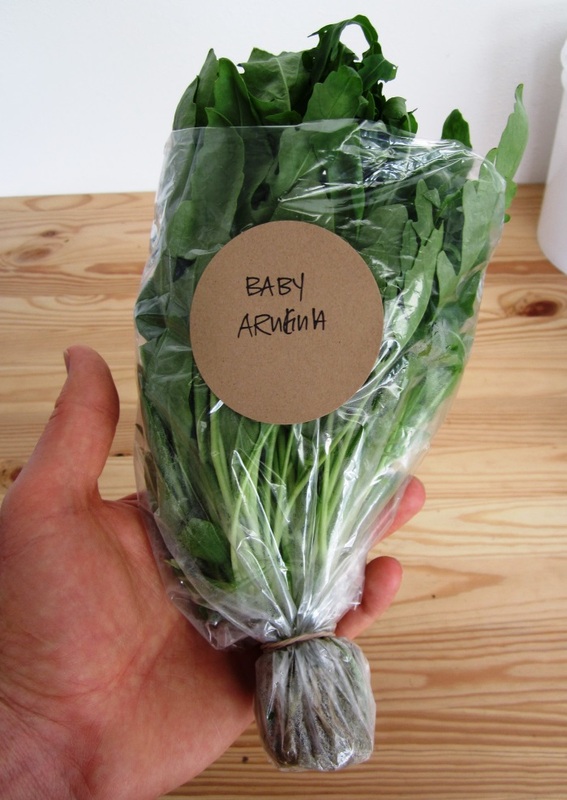 What are some of the ways you have tried to sell produce, and which way is the most profitable? We sell our produce “live”, with the roots attached. Living food grown in the aeroponic Tower Gardens produce the freshest, most flavorful aroma you can imagine, so the chefs really love it! 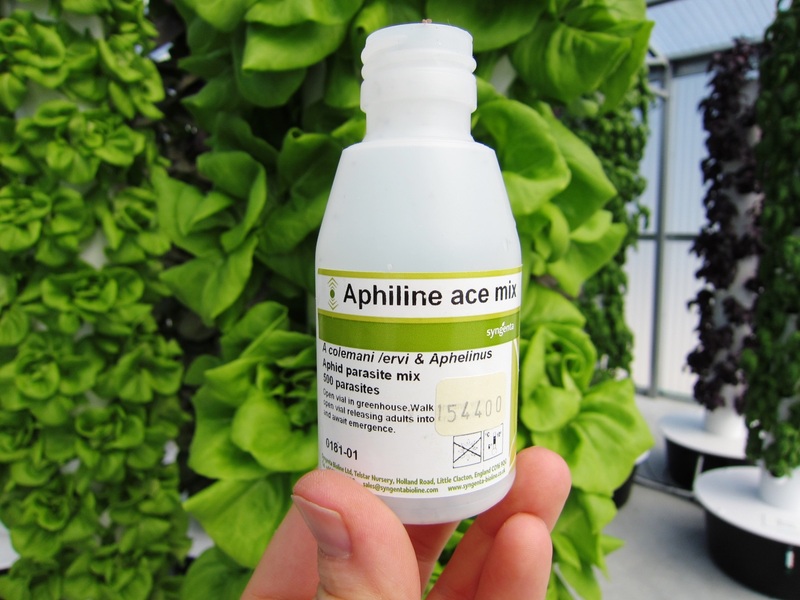 Petite sizes seem to be in demand with these clients, and I can turn these crops around in just 15 days with aeroponics! We sell and deliver directly to restaurants, which we find to be the most profitable. We also sell some plants through local produce distributors. Florida has some extreme growing conditions that can bring in the bugs and diseases. How do you combat that? 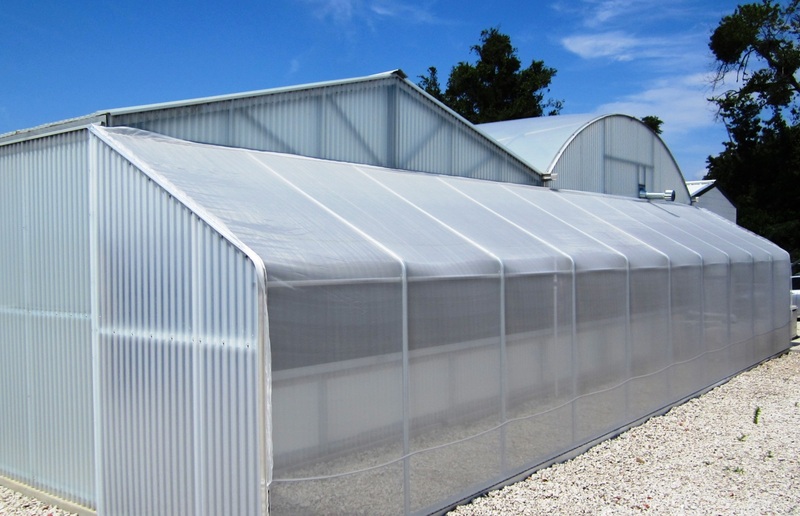 Our locally manufactured greenhouse from Imperial Builders and Supply is designed specifically for the harsh Florida climate. We have insect screens to keep the “bad” bugs out, evaporative cooling pads to keep us cool in the summer, and special light-diffusing plastic to keep the intense sun away from our crops. Growing our food vertically keeps the plants up off the ground and allows for plentiful air circulation, which deters most pests and diseases. We use only organic sprays or beneficial insects for the few pest challenges we encounter at specific times of the year. Releasing beneficial insects into the greenhouse. Katherine, based on the information you just provided, I calculate that you can produce 135,000 plants in this small area on an annual basis. That is a tremendous turnover. I know you like to spend a lot of time at home with your family, so how many employees do you have? Not too many, besides myself. We have one full-time manager, who oversees order fulfillment, seed planting, crop transplanting, and the cleaning and general greenhouse upkeep. We have a second full-time employee who works closely with the manager to fulfill the aforementioned jobs. We have an additional one to two part-time workers who help transplant, harvest, and maintain the greenhouse. We also work with a variety of community volunteers and college interns who help keep labor costs low, but gain education and experience in return. The GreenHouse volunteers hard at work! Katherine, besides meeting your business goals, what have you enjoyed most about your work? I love watching the expression on the chefs’ faces every time I walk in with a delivery! “Katherine is here!” they say, since they can smell the living food as soon as I walk in the door! I am also someone who tries to live a green lifestyle. With our cool greenhouse and vertical aeroponic technology, we have been able to show people that there is a solution to the environmental challenges we face in Florida. I can grow an enormous amount of plants vertically in my small greenhouse with as little as five percent of the water as the outdoor farmers. I don’t use contaminated agriculture water, herbicides, or chemicals. My food is nutrient-dense, clean, and free of harmful pathogens. People just love it! They have come to understand what we are about and stand for, and that has given us a loyal following. To learn more about Katherine and The GreenHouse, please click here. This entry was posted in Posts and tagged Beneficial insects, chemical-free food, d aeroponics, Emeril’s Orlando, EPCOT Center, farm to table, farm to table movement, Future Growing, Future Growing LLC, green rooftops, Hilton, Imperial Builders & Supply, Integrated Pest Management, IPM, Jessica Blank, Katherine Grandey, live produce, Living Produce, local food, Local Food Movement, locavore, locavore movement, Marriott World Center, Mike Grandey, modern agriculture, natural foods, Non-GMO, Non-GMO Foods, non-GMO products, Pest control, pesticide-free food, reduce the carbon footprint, Ritz Carlton, Rooftop Farm, Rooftop Farmer, rooftop farming, sustainability, sustainable, Sustainable agriculture, sustainable food, sustainable food movement, The Greenhouse, The Land, The Vertical Farmer, tim blank, Tower Garden, Urban Farm, Urban Farmer, urban farming, vertical farm, Vertical Farmer, Vertical Farming, vertical growing, Walt Disney World Company, water conservation in agriculture on February 12, 2014 by futuregrowing. 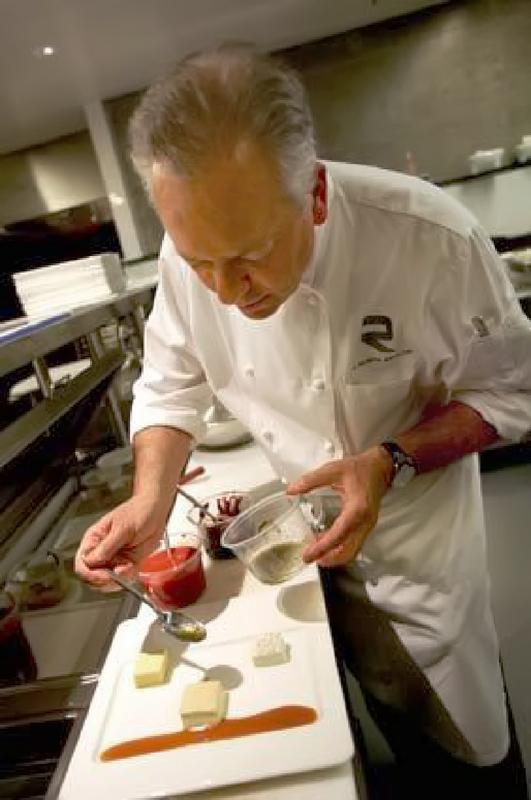 In 2011, renowned Chef John Sedlar received the prestigious “Chef of the Year” award from Esquire magazine for his cutting-edge neo-Latin cuisine. Sedlar is growing high in the sky of downtown Los Angeles for his second innovative roof-to-table concept, the Rivera restaurant on 1050 S. Flower Street, which features a Future Growing® Tower Garden® farm. That vision became Rivera, which not only takes its name from Sedlar’s Hispanic family name but also evokes the waters that flow through space and time to interlink the culinary traditions of Spanish-speaking Europe, North America, and South America. Being a steward of the environment, Sedlar is also very passionate about the reduced carbon footprint of his local food in a drought-stricken state. 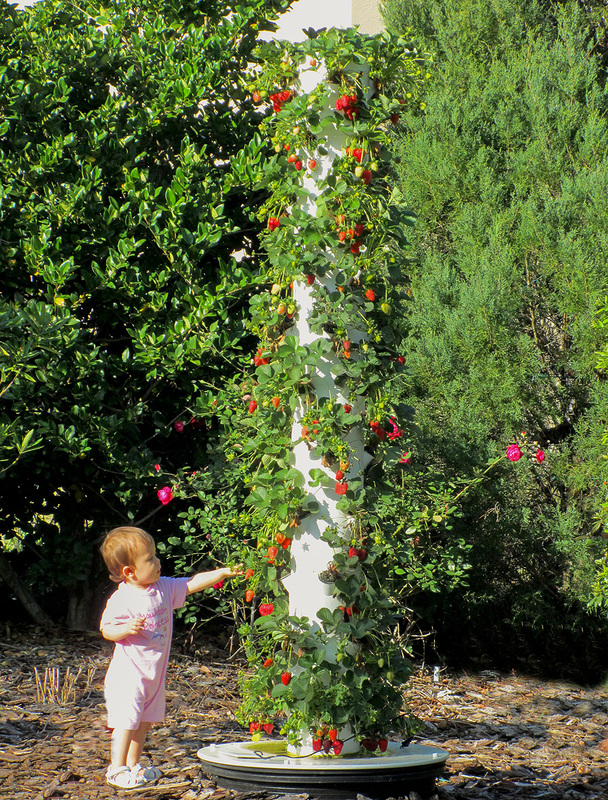 Because they are using the chemical-free, sustainable Tower Garden® system, 90 percent less water is used for growing. Sedlar and Chait know the restaurant’s food is safe and clean from harmful chemicals and diseases commonly found on modern farms. “Here, we’re utilizing space that would otherwise be ‘fallow land’, as it were. And in terms of cost, the towers are much more efficient at producing crops per square inch than any other system, because we are growing up instead of out,” Chait said. Bill has a vision to see all 16 of his restaurants producing a lot of their fresh food vertically in roof-to-table settings such as Rivera’s. To view more images of the Rivera vertical rooftop farm, click here. You can also view an image gallery of Sedlar’s “Cielo Verde” rooftop Tower Garden® farm by clicking here. 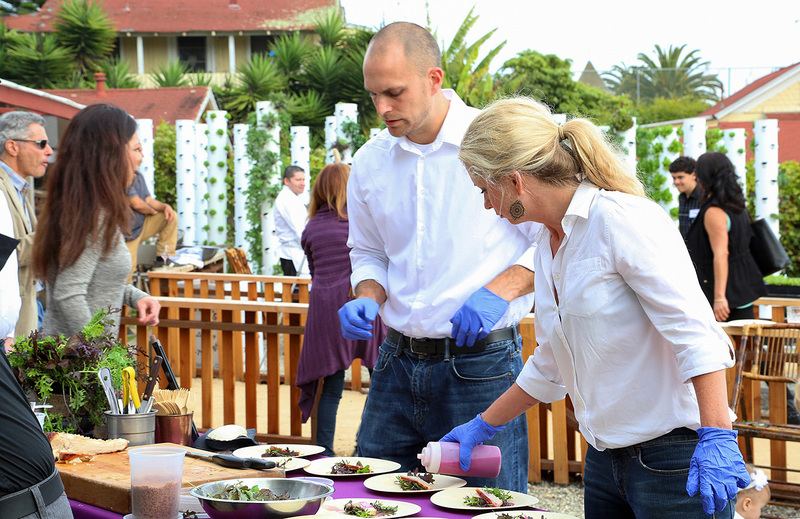 I would personally like to thank our fellow farmer, Chef John Sedlar, for being an innovative leader in the West Coast local food movement. Together we are changing local food one rooftop at a time. If you visit Los Angeles, please take some time to experience the amazing Rivera downtown. This entry was posted in Posts and tagged agriculture, Beneficial insects, California, Chef John Sedlar, chemical-free, conservation, farm to table, food service, Future Growing, Future Growing LLC, green rooftops, hyper-local sourcing, Integrated Pest Management, IPM, live produce, Living Produce, local food, Local Food Movement, locally grown, locavore, Los Angeles, modern agriculture, movement, natural foods, Non-GMO, Non-GMO Foods, non-GMO products, Pest control, pesticide-free food, reduced carbon footprint, Restaurant, restaurants, Rivera, Rooftop Farm, Rooftop Farmer, rooftop farming, sustainability, sustainable, sustainable food, sustainable food movement, The Vertical Farmer, tim blank, Tower Garden, Urban Farm, Urban Farmer, urban farming, vertical farm, Vertical Farmer, Vertical Farming, vertical growing, water on February 5, 2014 by futuregrowing. 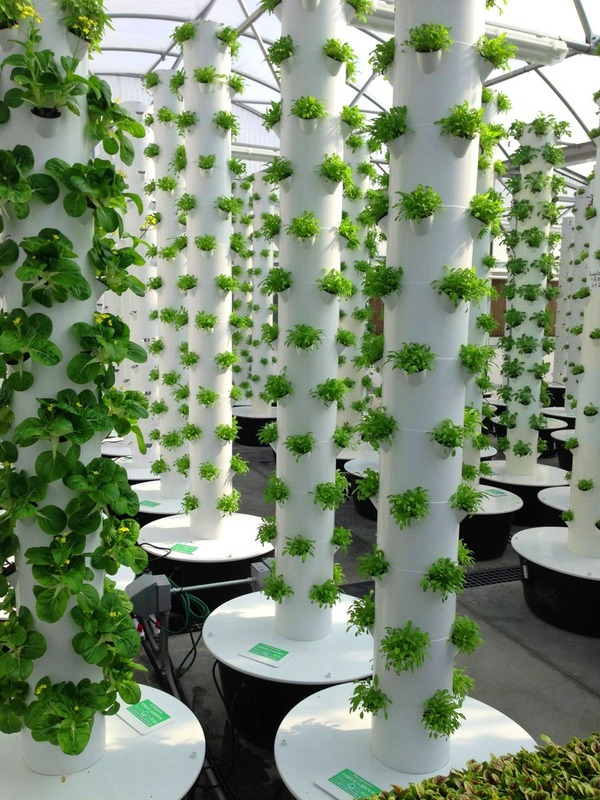 Welcome to a “green” future, growing healthy and sustainable food with aeroponic technology! 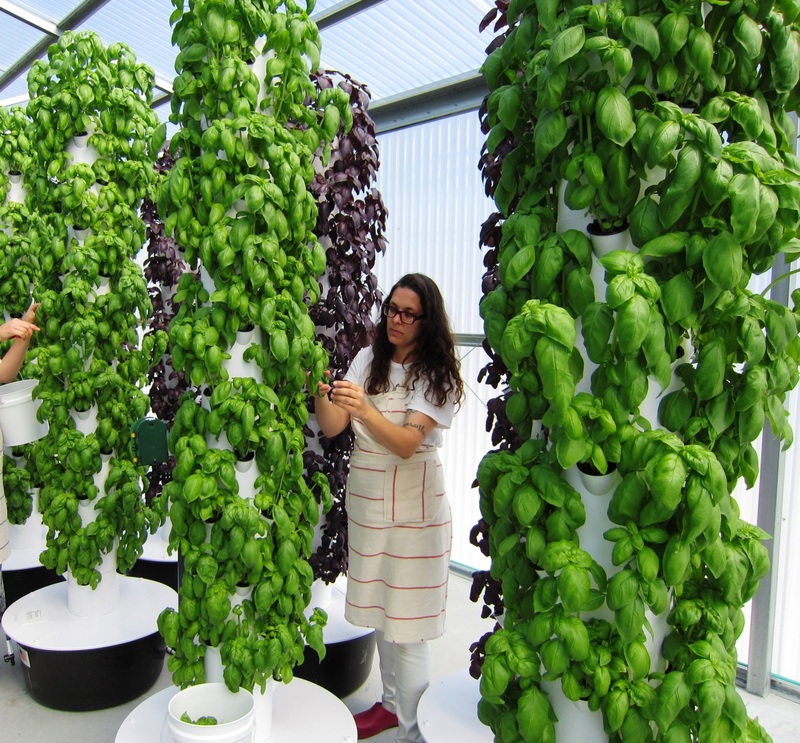 Over the past decade, Future Growing® has pioneered the vertical aeroponic farming movement across the United States. Our vertical growing technology is so modern and innovative, that it has been approved by the U.S. Green Building Council for LEED points on certified green buildings. With more than 100 successful projects across North America, Future Growing® modular farm technologies now come in all sizes and shapes. Our Tower Garden® farms are located in a myriad of locations, from conventional commercial greenhouse structures, to skyscraper rooftops in Manhattan, to farms in airport terminals. Behind each of these successful farms is an extraordinary individual with a passion for local, sustainable food and modern agriculture. Meet one of these extraordinary urban farmers in the “Meet Your Makers” video segment below. This entry was posted in Posts and tagged Beneficial insects, Chapala Gardens, chemical-free food, farm to table, farm to table movement, food service, Future Growing, Future Growing LLC, green rooftops, hyper-local sourcing, Integrated Pest Management, IPM, Jake Kelly, Jessica Blank, jobs, live produce, Living Produce, local food, Local Food Movement, locally grown, locavore, locavore movement, modern agriculture, natural foods, Non-GMO, Non-GMO Foods, non-GMO products, Pest control, pesticide-free food, Progressive Insurance, QSR Magazine, reduce the carbon footprint, Restaurant, restaurants, Rooftop Farm, Rooftop Farmer, rooftop farming, Santa Barbara, sustainability, sustainable, Sustainable agriculture, sustainable food, sustainable food movement, The Vertical Farmer, tim blank, Tower Garden, Urban Farm, Urban Farmer, urban farming, vertical farm, Vertical Farmer, Vertical Farming, vertical growing, water conservation in agriculture on January 22, 2014 by futuregrowing. Farm to table in 50 steps or less. Those of us deeply committed to the “green” movement have developed an acute awareness about the food we eat, consumer purchasing trends, and the current status of our planet’s resources. Those committed to living sustainably and ensuring a high quality, chemical-free food supply for our children’s future are aware of the truth. We are not fooled by the million dollar advertising campaigns and propaganda put forth by big business. So many people today are frustrated and even enraged with the “do nothing” government, big business, and big agriculture. The battle will not be won with tricky politics and big money; instead, it is being won by simple, honest choices. Children eat what they grow. The truth is that this modern green movement is the largest movement of its kind in the history of the world that was not pushed forward by government or religion—or by any other big institution, for that matter. The movement is grassroots: it is you and me, it is one person at a time, making choices of integrity and thoughtfulness, leading to the unstoppable mass we have today. Creative cuisine with phytonutrient-rich food. Congratulations to all of you who are committed to the local food movement and a sustainable way of life. Click on the link below to see what the National Restaurant Association predicts will be the top menu trends for the coming year in its annual “What’s Hot” culinary forecast. You will see trends brought about urban farmers and aeroponic growers, along with consumers who are demanding a healthier, more eco-friendly food supply. Together, we are making a significant impact on consumers’ health and eating habits in 2014 and beyond! This entry was posted in Posts and tagged Beneficial insects, chemical-free food, farm to table, farm to table movement, food service, Future Growing, Future Growing LLC, green rooftops, hyper-local sourcing, Integrated Pest Management, IPM, Jessica Blank, jobs, live produce, Living Produce, local food, Local Food Movement, locally grown, locavore, locavore movement, modern agriculture, natural foods, Non-GMO, Non-GMO Foods, non-GMO products, Pest control, pesticide-free food, Progressive Insurance, QSR Magazine, reduce the carbon footprint, Restaurant, restaurants, Rooftop Farm, Rooftop Farmer, rooftop farming, sustainability, sustainable, Sustainable agriculture, sustainable food, sustainable food movement, The Vertical Farmer, tim blank, Tower Garden, Urban Farm, Urban Farmer, urban farming, vertical farm, Vertical Farmer, Vertical Farming, vertical growing, water conservation in agriculture on January 8, 2014 by futuregrowing. Since 2006, Future Growing® has been partnering with the nation’s leading schools to create healthier lunches and hands-on science lessons. It’s gratifying to see Future Growing®’s aeroponic technology being welcomed by education, because we know firsthand how students of all ages benefit from learning to grow food in their own schools. These kids will soon be the decision-makers of the 21st century, and will be faced with serious choices on managing our future supplies and quality of water, air, and soil. 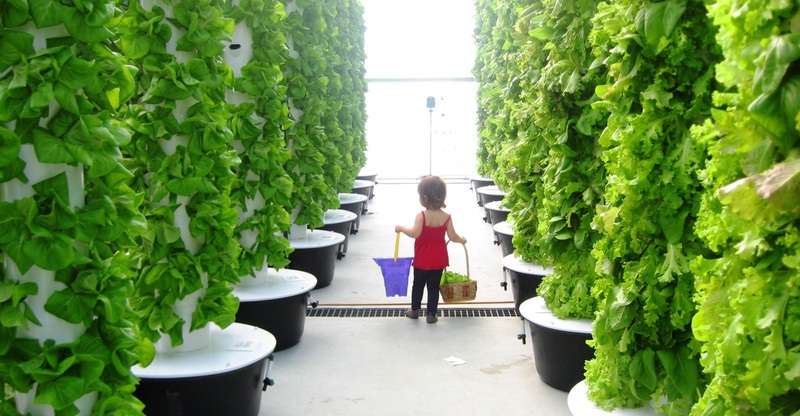 Here are some of the innovative schools—ranging from preschools to colleges—using Future Growing®’s aeroponic technology to teach students about how to grow healthy, sustainable Tower Garden® produce and nourish their bodies in a healthy way. 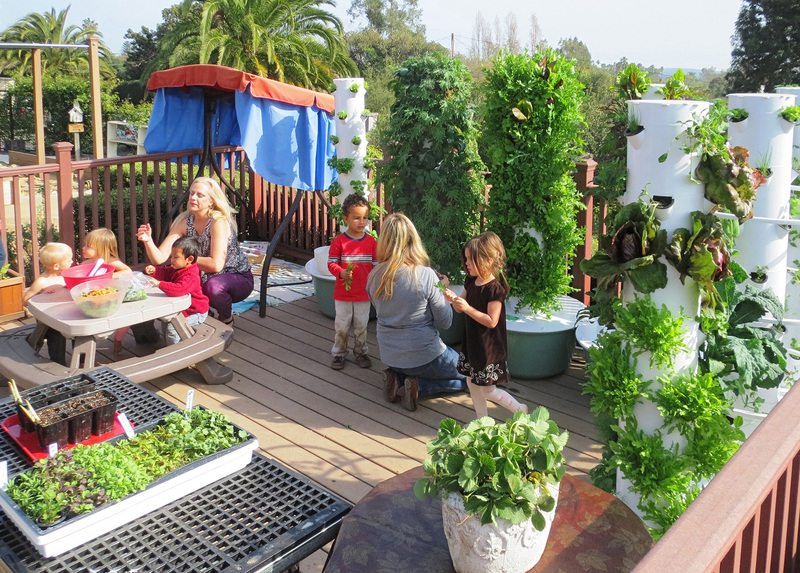 Hope 4 Kids Preschool in Santa Barbara, Calif., believes in healthy eating and healthy living, and is the first preschool in the world to have a commercial Tower Garden® farm. Hope 4 Kids offers tasty and nutritious meals and cooking activities. The staff at Hope 4 Kids reports: “We love our commercial Tower Garden® farm because it is so simple and always produces amazingly tasty and nutritious fruits and vegetables! 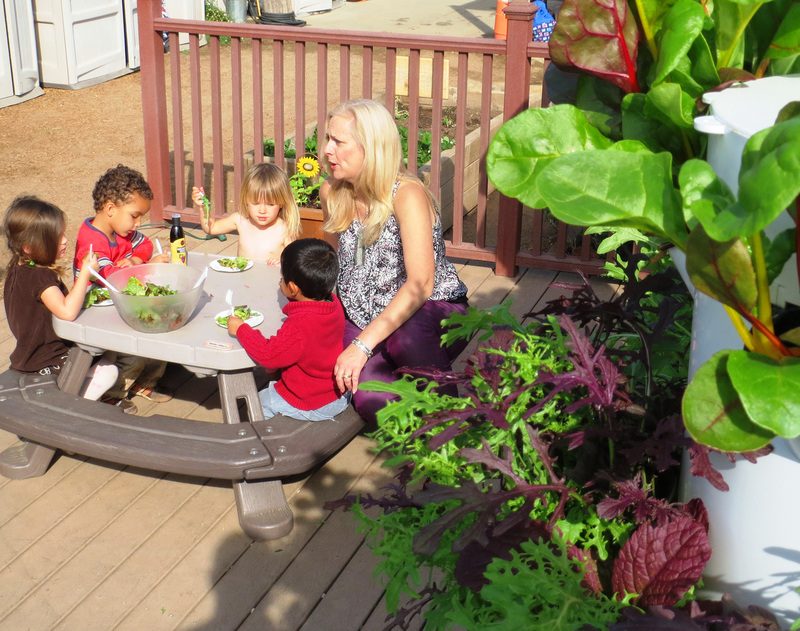 The first preschool in the world to have a commercial Tower Garden® farm. 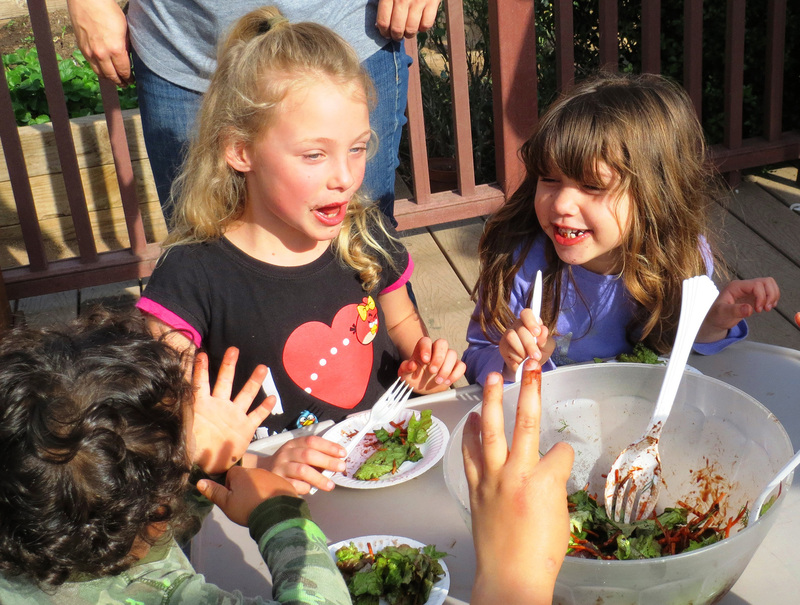 The school offers tasty and nutritious cooking activities for students, teaching them how to make and eat healthy foods such as Tower Garden® salads, guacamole, pico de gallo, and kale chips. 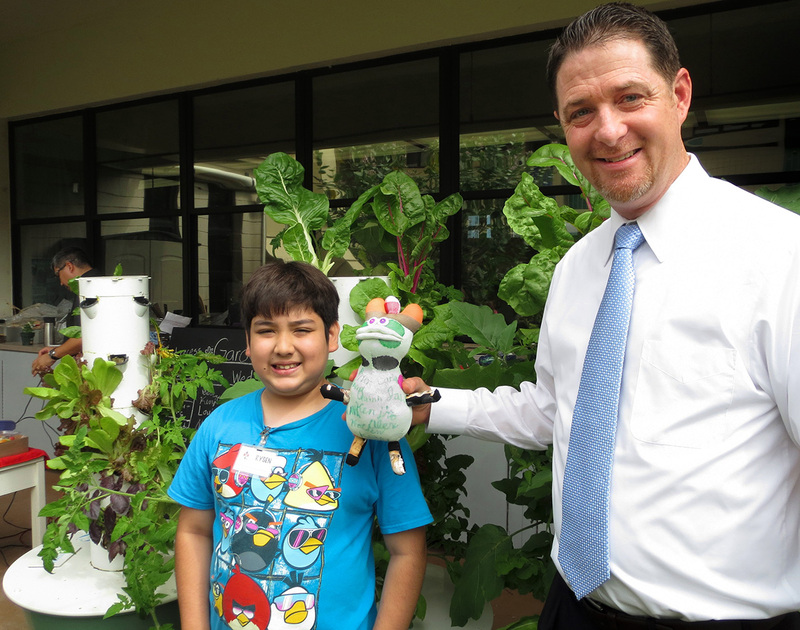 To learn more about Hope 4 Kids’ Future Growing® Tower Garden® farm, click here. In Destrehan, La., Harry Hurst Middle School’s “Green Team”, led by seventh grade teacher Julie Rexford, was awarded the Healthy Community Grant from the Keep Louisiana Beautiful organization in 2013. The grant allowed the middle school to start an aeroponic Tower Garden® farm. 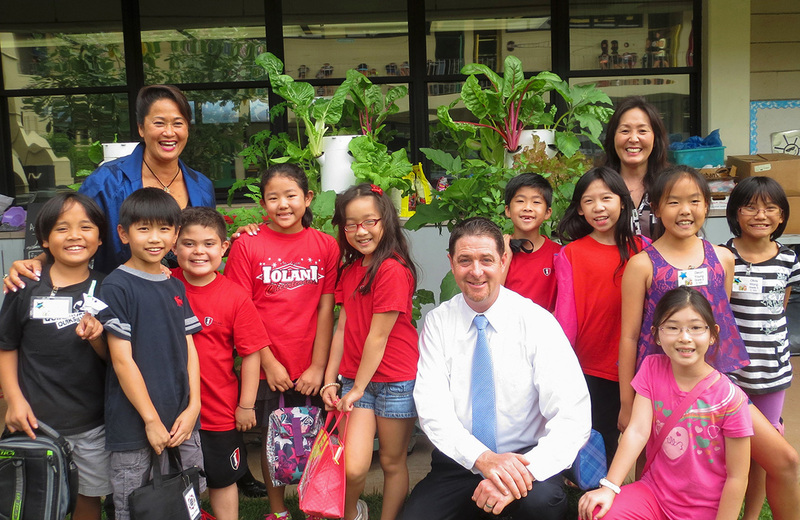 Students participate in growing produce on campus that is served within the school cafeteria. What an innovative way for students to experience what high quality, chemical-free produce actually tastes like! This system allows students to participate in every aspect of sustainable gardening. For more information about the Hurst Middle School project, click here. 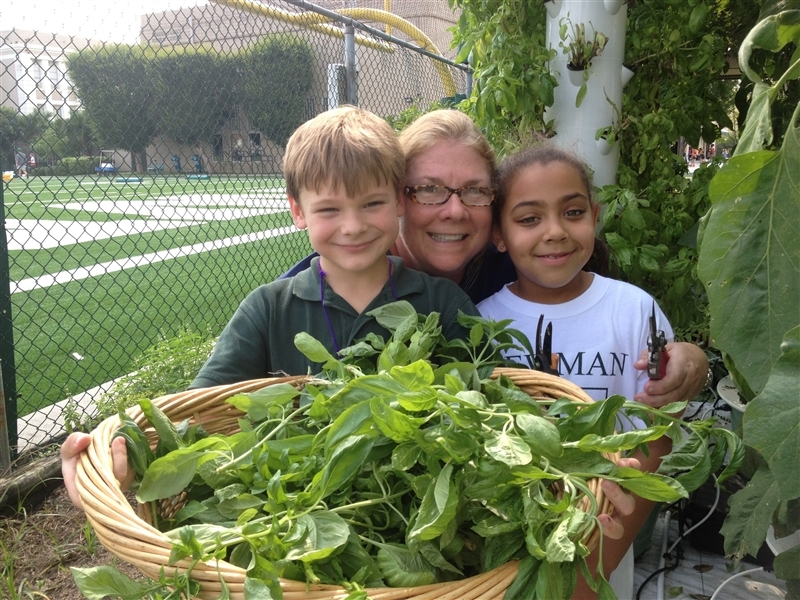 In New Orleans, Isidore Newman School’s foodservice director, Trudi Ruppenicker, worked with Sage Dining to bring a Future Growing® Tower Garden® farm to the school. Students help germinate the seeds and harvest the produce. The students can also learn about sustainability, water conservation, the life cycles of plants, and the benefits of locally sourced foods. Special signs on menu items containing home-grown foods inform the diners and generate more interest in the program. Click here to view the rest of the photo gallery. The Green Bronx Machine has become an urban farming revolution in Bronx classrooms. Stephen Ritz, a Bronx-born-and-bred public school teacher, is creating a revolution in his community by introducing students to something unexpected—aeroponic farming. By teaching his disadvantaged students where food comes from and how to grow their own, he is also helping them grow life skills and cultivate brighter futures. 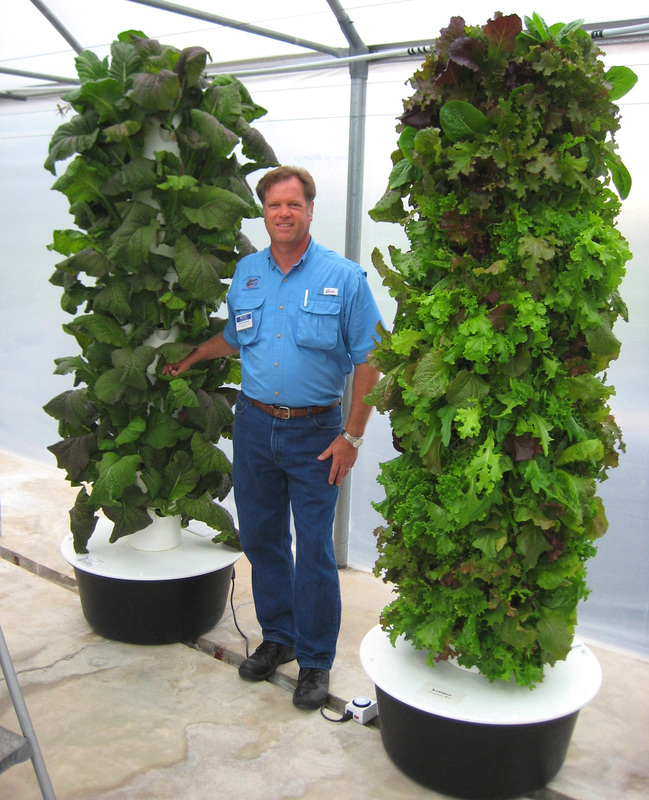 University of Florida scientist researches hydroponic systems for small family and urban farms. The University of Florida’s Agricultural Extension Center in Live Oak, Fla., is working with sustainable “green” technologies from Future Growing. 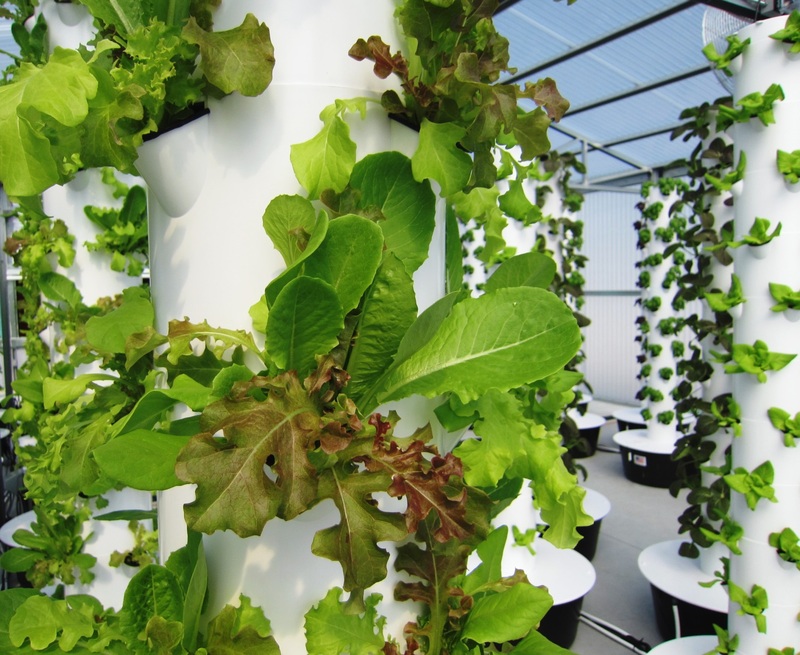 The Tower Garden® technology has been used in the facility’s research since 2007. The Extension Center also offers a course where students learn soil-less growing techniques and are given a tour of the research facility to see the growing systems in operation. From its inception, Future Growing® has cultivated relationships with schools all over the country, recognizing that the health of our bodies—and our planet—will be in the hands of these bright young students. This entry was posted in Posts and tagged Apron Project, Beneficial insects, chemical-free food, farm to table, farm to table movement, food service, Future Growing, Future Growing LLC, Green Bronx Machine, green rooftops, Harry Hurst Middle School, Hope 4 Kids, hyper-local sourcing, Integrated Pest Management, IPM, Isidore Newman School, Jessica Blank, LA Urban Farms, live produce, Living Produce, local food, Local Food Movement, locally grown, locavore, locavore movement, modern agriculture, Montecito Urban Farms, natural foods, Non-GMO, Non-GMO Foods, non-GMO products, Pest control, pesticide-free food, Progressive Insurance, QSR Magazine, reduce the carbon footprint, Restaurant, restaurants, Rooftop Farm, Rooftop Farmer, rooftop farming, Stephen Ritz, sustainability, sustainable, Sustainable agriculture, sustainable food, sustainable food movement, The Vertical Farmer, tim blank, Tower Garden, Trudi Ruppenicker, University of Florida, Urban Farm, Urban Farmer, urban farming, vertical farm, Vertical Farmer, Vertical Farming, vertical growing, water conservation in agriculture on December 18, 2013 by futuregrowing.